"This team has no fear." Mets fan Tim Robbins narrates, opening with the inevitable nod to the 1986 Mets, and the new era begins with the ascendance of general manager Omar Minaya�we see him spending the Wilpons' money and signing on Pedro Martinez, Carlos Delgado, Beltr�n, Billy Wagner, Paul Lo Duca. (There's not a peep here about Mike Piazza, or Steve Phillips, or Bobby Valentine. Not even a Doug Sisk cameo.) Willie Randolph finally gets to manage in the bigs and comes over from the Bronx�apparently there's another professional baseball team in the city�and the film makes much of the team's connection to its fans and its home. Mike Bloomberg cheerleads for the team, and, of course, Mr. Met is in the house. The team got out to an early lead, so the film tries to gin up some drama out of regular season games with the Phillies and Diamondbacks, among others, but we're waiting to get to October�we also get a good dose of the Mets being good citizens (visiting schools, and so on), reflections from sportswriters who cover the team, and many highlights with calls from Mets broadcasters: Gary Cohen, Fran Healy, Howie Rose, and the greatest player in baseball history, Tom Seaver. And so to the playoffs�there's the sweep of the Dodgers, and then the series against St. Louis. You'd think that Endy Chavez's spectacular catch in Game 6, robbing Scott Rolen of a certain home run, meant that the baseball gods were smiling upon Queens�I'm still a little hoarse from whooping it up after that one, and given the decibel level of the voice mail I received from my dOc editor, I bet she is too�but blah blah blah Molina, blah La Russa, blah blah World Series blah di blah di blah. 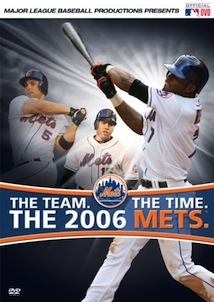 Tune into this space a year from now, when I will be reviewing the official DVD of your 2007 World Champion New York Mets. Image Transfer Review: The contrast level is kind of high, but the transfer is certainly adequate. Audio Transfer Review: If you don't want to listen to Robbins, the team's Spanish-language radio broadcasters supply a track of their own�either way, dynamics are limited, but it's all sufficiently clear. Extras Review: We're spared any regrets in the extras package, which instead leads off with a collection (20m:35s) of highlights from the Mets' string of walkoff wins, followed by the team clinching the NL East (02m:35s) and beating the Dodgers in the wild card round (04m:28s). Delgado and Beltr�n are featured in a Spanish-language piece (03m:16s), and finally there's a promo (05m:19s) for CitiField, future home of the Mets, and one more nail in Robert Moses' coffin as Shea Stadium, kind of a monstrosity of a ballpark, actually, goes kablooey. A cheering look at a season that went well but came up short. This is why there's always next year.